Julie moved in to Wishbone Way in June 2016. She used to live with her twin sister in a bungalow in Woking. “I had another floating support provider but they weren’t very good. My care manager told me about Wishbone and I came to see what it was like. As soon as I saw it I really liked it – it’s big and clean and the people I met were nice. I bought all my things with me from the bungalow and enjoyed laying them all out however I wanted them. 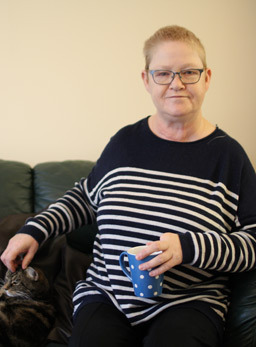 “I really like living here because there is always support when I need it or if I just want a chat. I have support everyday if I want it. “I have a cat called George – he’s a rescue cat and is about 3 years old. I was allowed to bring him with me and he loves it here too. Living here helps me to be independent and make my own choices. “I like doing crochet, colouring and listening to music; I also love horror films. I feel happier here having my own space and I get on with all my neighbours.